Left in a basket for someone to find on a river , just like Moses. Elodie is left to grow up in an orphanage. A striking young girl, she has captured everyone's hearts but some parents see her as a threat and white trash as that's where little Orphan girls belong. While out one day, Elodie is approached by a fashion model scout and soon her world is thrown upside down as one modelling job leads to another and soon Elodie is being flown all over the world and living a life far from her days as an orphan girl. Elodie soon discovers though that to get places in the world of modelling , you have to learn a few tricks and that includes using your best assets to get the best jobs and perks that come with modelling as in the world of modelling, it really is - who you know and where they can get you. 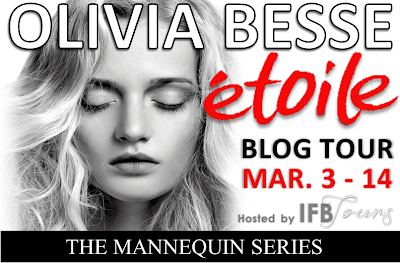 The Mannequin Series Book #1 follows Elodie on her whirlwind adventures of the inside modelling world from Paris to London to New York. Etoile is the perfect read for those who are fascinated with the Modelling industry and love to read the insider scoop of what happens behind the scenes of the glitz , glamour and fame.